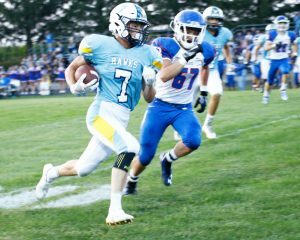 Right from the start, the Lynnville-Sully football team gave the BGM Bears trouble on Friday, Sept. 1. The Hawks hosted BGM and were able to score every quarter, triumphing over the Bears, 32-7. This gave BGM their second loss and the Hawks their second win of the season. And it was a “great win,” according to L-S Coach Mike Parkinson. Senior Sage Zylstra uses his speed to outrun a BGM Bear in Friday’s home game. Zylstra was the Hawks’ leading rusher with 70 yards. The L-S boys came out ready to play. After BGM fumbled during the first drive, senior Sage Zylstra recovered the ball, leading to the Hawks’ first scoring affair less than three minutes into the game. Junior Nate Stock ran 40 yards in, followed by a successful two-point conversion run in by Zylstra. After another fumble by the Bears recovered by senior Kemper Lukehart, junior Tyson Vander Linden carried the ball 23 yards in for a touchdown with 4:34 on the first-quarter clock. The PAT kick by senior Brevin Hansen was good, bringing the score to 15-0. Halfway through the second quarter, Zylstra had a run for 30 yards, earning the Hawks another six points. The PAT by Hansen was successful. Coming out of halftime, the Hawk defense continued to shut down the Bears while the L-S offense kept rolling. With 8:06 left in the third, the L-S boys couldn’t make it to the end zone, but Hansen kicked a 22-yard field goal. Going into the fourth and final quarter with L-S leading 25-0, less than a minute in, senior Elijah Collins fired the ball to senior Tanner Foster for a 54-yard touchdown pass. Hansen completed another PAT. The final scoring affair of the night was by the Bears with 4:21 left to go, bringing the final score to 32-7. Frustrating many football fans, there were over 20 penalties in the game: L-S with 11 and BGM with 10, totaling over 200 yards. Junior Tyson Vander Linden carries the ball for L-S on his way to scoring a touchdown against BGM last Friday. Zylstra led the Hawks in rushing, running the ball 70 yards on nine carries, scoring one touchdown. Stock followed behind him with 56 yards on five carries, also scoring a touchdown. Collins passed for 103 yards, completing four passes and throwing one interception. Foster had the longest reception of the night with a 54-yard pass that led to a touchdown. On the defensive end, junior Gage Vander Leest led the night in tackles, aggregating eight, two of which were for negative yards. Senior Jesse Van Wyk and Zylstra both had seven. Four others had six, one of them being Lukehart, who also had two sacks. L-S is scheduled to face North Mahaska on Senior Night this Friday, Sept. 8.